100g pack of our Garlic ginger beef jerky. You must try this! The garlic and ginger merge to give a truly unique and irresistible taste. 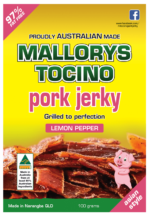 Our customers say we have the best beef jerky in Brisbane. Special Offer – buy 10+ packs of our 100g jerky and pay no postage on them. 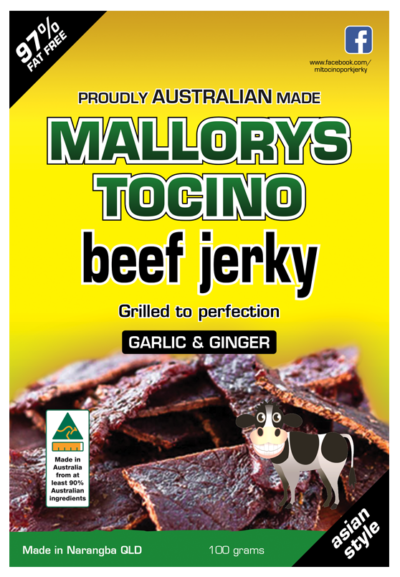 Awesome tasting garlic and ginger beef jerky. A great healthy lunchbox snack, or afternoon tea. I received my parcel today. I am so glad I took advantage of the 10x100g special. I got to try them all. My family and I love them. Best jerky I have tasted.